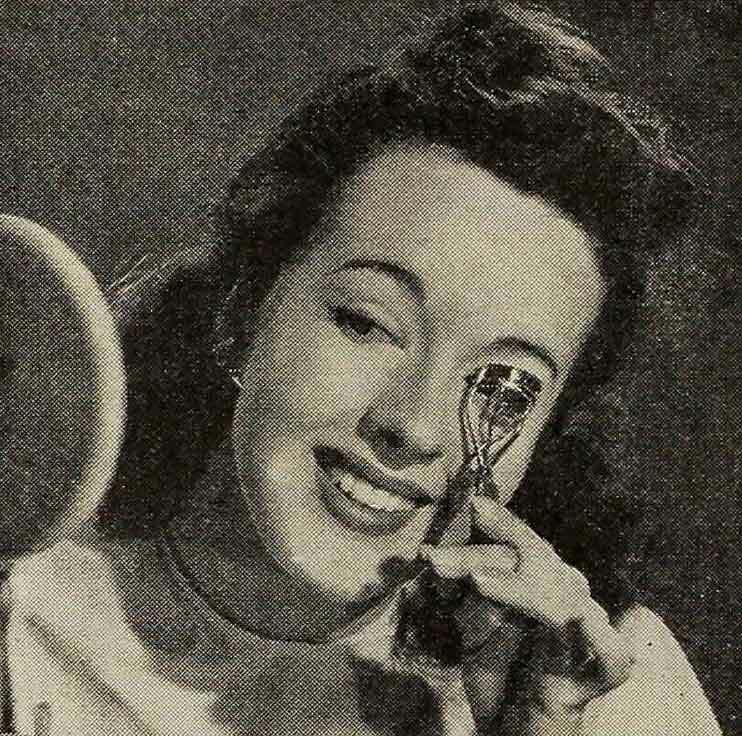 Want to Know a Secret – 1941 Eye Make-up Tips. Want to Know a Secret? 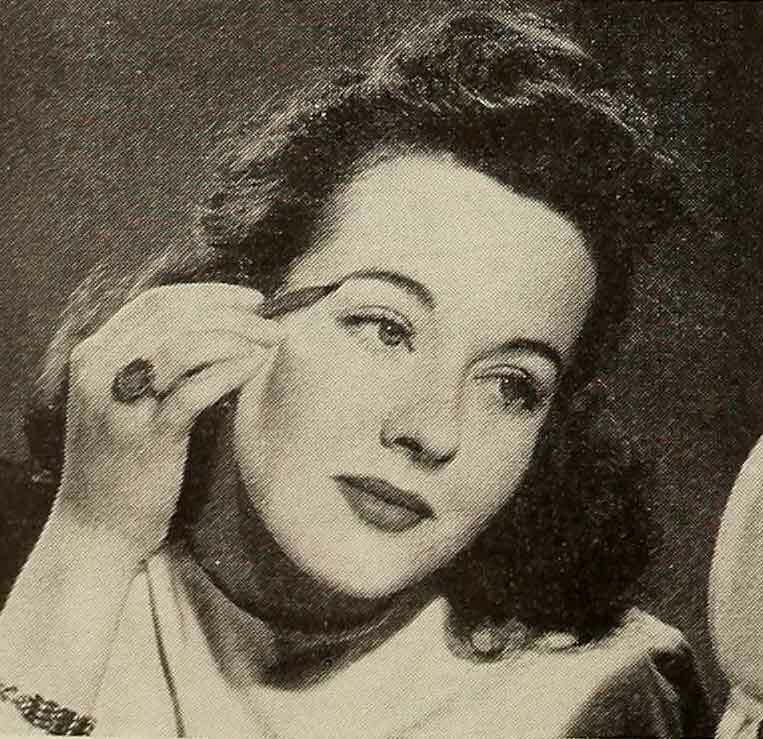 – 1941 Eye Make-up Tips. 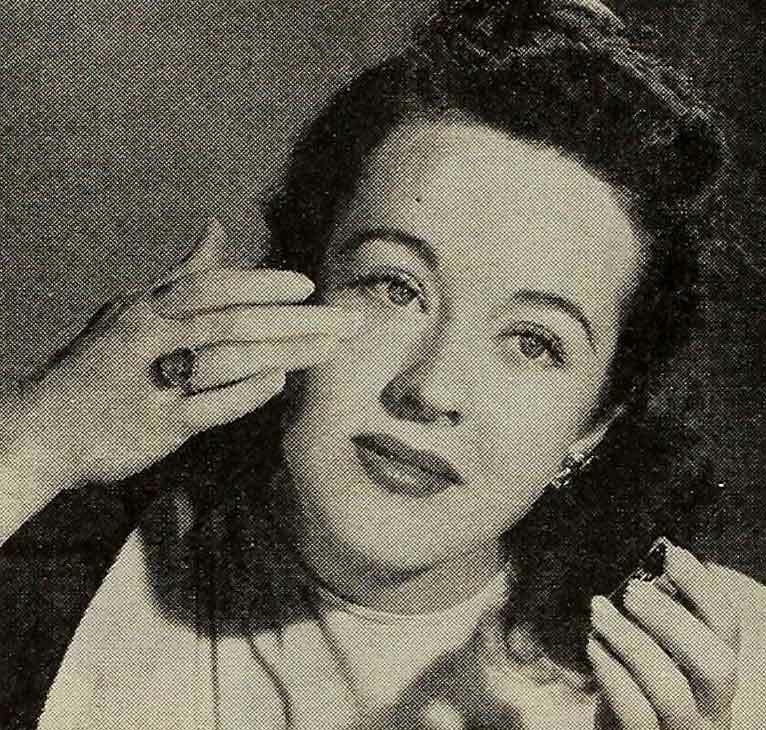 Back to 1941 now as Hollywood Beauty editor Ann Vernon and actress Peggy Moran show how you can accomplish wonders with your eyes – and learn the secret of mascara application. For wide-awake eyes – Universal’s Peggy Moran uses eye lotion twice daily. BRIGHT EYES … Without clear sparkling eyes like Peggy Moran’s, you can’t hope to accomplish a miracle, for cosmetics only call attention to dull and bloodshot orbs. While nature provides a cleansing fluid for the eyeballs, it’s wise to give her a little extra help, especially since most of us abuse our eyes by overstraining them at work, too much smoking or outdoor life. Every night and morning give yours a refreshing bath with a fine, reputable lotion. 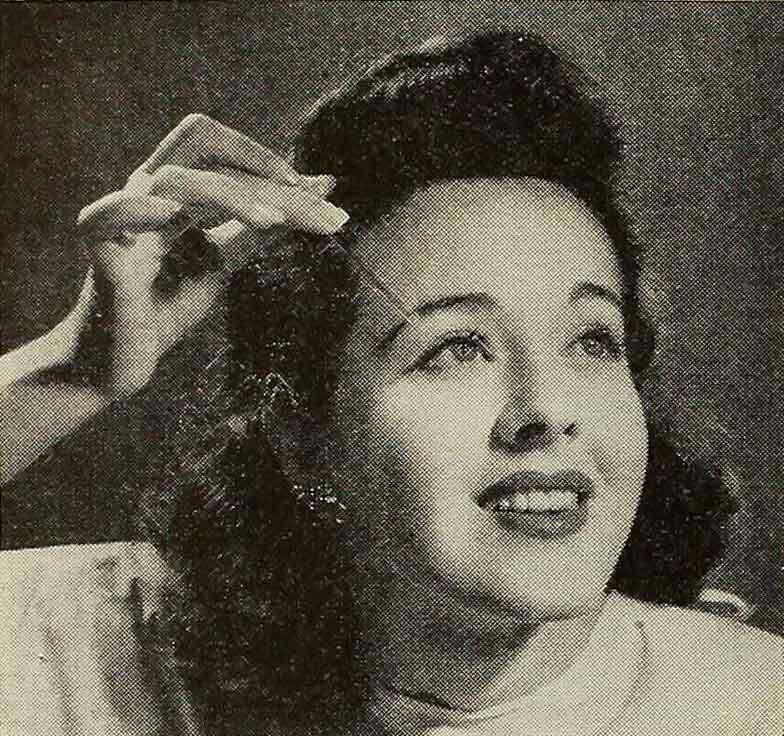 Peggy shows how to camouflage under-eye circles. YOUNG AND FAIR .. You can look fresh and youthful at 16 or 36 if you avoid dark circles under your eyes. Lots of sleep and a correct diet helps prevent them, but when you do indulge you can immediately conceal you naughtiness by covering with a small blend of Max Factor Foundation – blended into your moisturiser. Dab this over all over your eyes before you apply your normal foundation. Try applying eye-shadow with a soft artist’s brush to get the subtle effect of the stars. BRUSH WORK …Peggy isn’t painting her own portrait – she’s applying eye shadow with a tiny camel’s hair brush like a make-up artist. Its the most accurate way of tracing a seductive hint of eye shadow on your lids, and a method you won’t ever desert for the little finger technique, once you’ve tried it. So go shopping girl for some artists brushes. You can get them in any artists store. 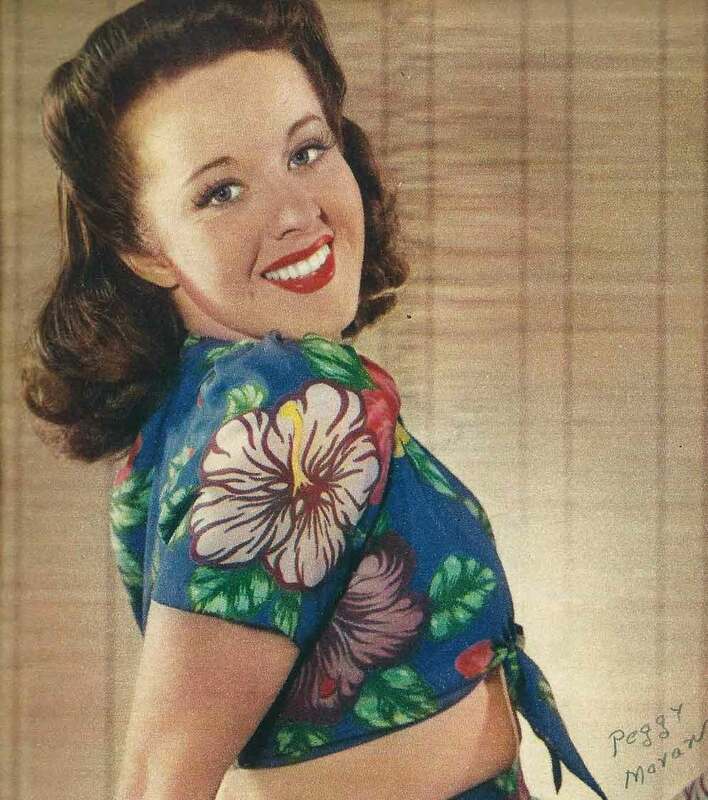 Peggy’s smiling broadly because she knows there’s nothing more glamorous than curly eyelashes. CURL UP IN STYLE …. What’s the good of long dark lashes, if they don’t have a nice, modified cinnamon bun curl? Very little, because they won’t be noticed unless they curl over the upper lid. 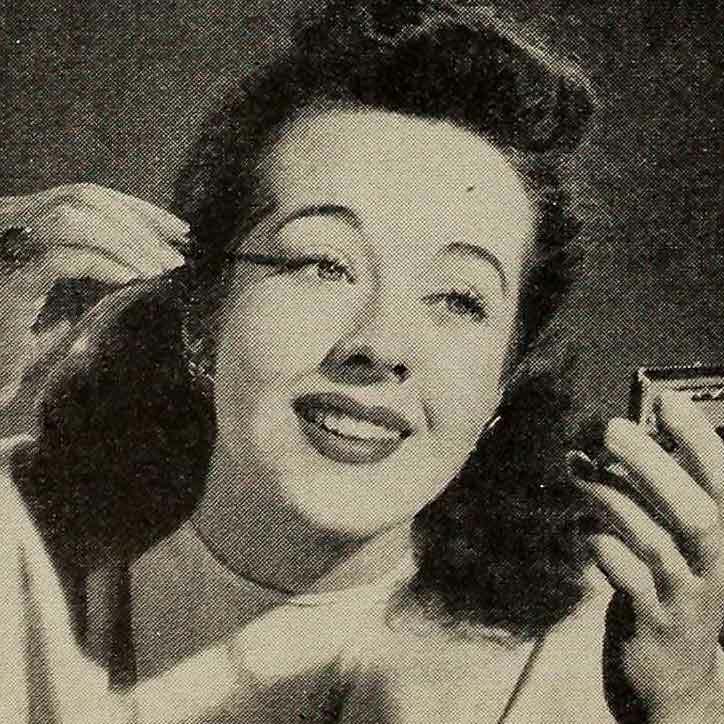 Peggy and all her Hollywood co-stars know this and none of them go without a good eyelash curler. On the market for years, there are now several advanced models for sale in your local beauty salons – so head on down and purchase one. You simply clamp the rubber protected bows over your upper lashes, count to 40 and lo! your lashes are curled for the whole day. I have used one for years and consider a lash curler as essential as my lipstick. Deepen the colour of your brows, but carefully. Ann Vernon explains how Peggy does it. DRAWING LESSON … Don’t ever try to use an eyebrow pencil at right angles to the skin, as you use a pencil on paper. This produces a harsh line that looks not even remotely like the feathery line of an eyebrow. Follow Peggy’s rule and hold the pencil parallel to the brow, draw on short, slanting strokes to fill in colour. And do use a pencil that is the best seller in the field. I personally use pencils manufactured by Helena Rubinstein – and I recommend them. 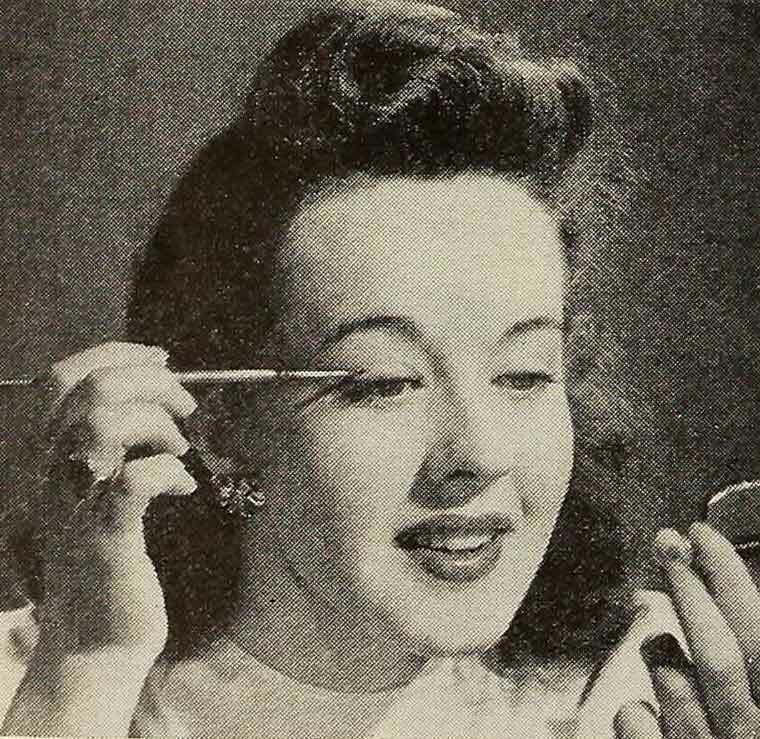 1940’s Mascara Secret – 2 sweeps – one sideways – then,with a clean brush – brush upwards to blend and remove excess. THE FINAL TOUCH .. I’ve saved the frosting until last.The best part of all eye make-up is mascara, because it does such a wonderful transformation job – making light, scant lashes look longer, darker and lovelier instantly. You need two brushes to apply mascara correctly! Apply it only on the upper lashes – first sweeping gently across – then sweeping upwards with a clean brush to remove excess. You can now choose between the traditional cake mascara and the newer cream variety. Want the name of the top mascara? You already know it – Maybelline. After all they invented it! Learn the 12 Steps to a Hollywood Makeover. I keep trying other brands but I keep coming back to the classic: Maybelline! And this tutorial reminds me that I should be more diligent about using my eyelash curler.